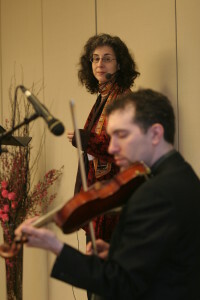 In 1996, Public Radio International teamed up with WGBH Radio Boston to create a nationally-broadcast weekly public radio series focused around Ellen Kushner’s strengths as writer, host and producer: Sound & Spirit, a weekly series of hour-long radio programs exploring the human spirit through music and ideas. The Door is Opened: A Jewish High Holiday Meditation, the program Kushner produced originally as an independent special, which inspired PRI to suggest a weekly series covering the music and traditions of the world’s peoples. A full list of all episodes can be found archived here. As of 2019, WGBH has changed its archives and these shows are not currently available. We are working on finding a solution, so check this space. Meanwhile, if you would like to request a particular show be made available for temporary online access, contact WGBH’s Open Vault here. Each 59 minutes of weekly airtime was an intricate piece of radio art, interweaving music and spoken word, reflecting over 80 hours of work from Ellen and her tiny but mighty staff of researchers, producers and WGBH Radio engineers—one of whom once estimated that each weekly hour of Sound & Spirit contained about 100 different sound cues. Two of her one-woman touring musical shows, Esther: the Feast of Masks and The Golden Dreydl, were originally created for the series, and Ellen and her remarkable staff also produced two albums: Welcoming Children Into the World and The Golden Dreydl. Guests included musicians Stella Chiweshe, Sheila Chandra, Mickey Hart, Bob Franke, Frank London, authors Jean Shinoda Bolen, Carol Pearson, Jane Yolen and many more. When the show ended in June 2010, Ellen wrote this note of farewell to her listeners.